Our User Interfaces research group investigates novel computational methods for design and adaptation of user interfaces, ranging from keyboards to menus, buttons, and web pages. We have recently launched a new web service which aids research on self-optimizing websites. Our service, Brain Twister, is a collection of puzzles, mini-games and cognitive experiments, which you can run in the browser. Brain Twister offers users nostalgic mini-games such as Snake and Breakout, puzzles like Sudoku and Tenpair to challenge your logical thinking, and other science-based cognitive experiments that let you measure your capabilities. 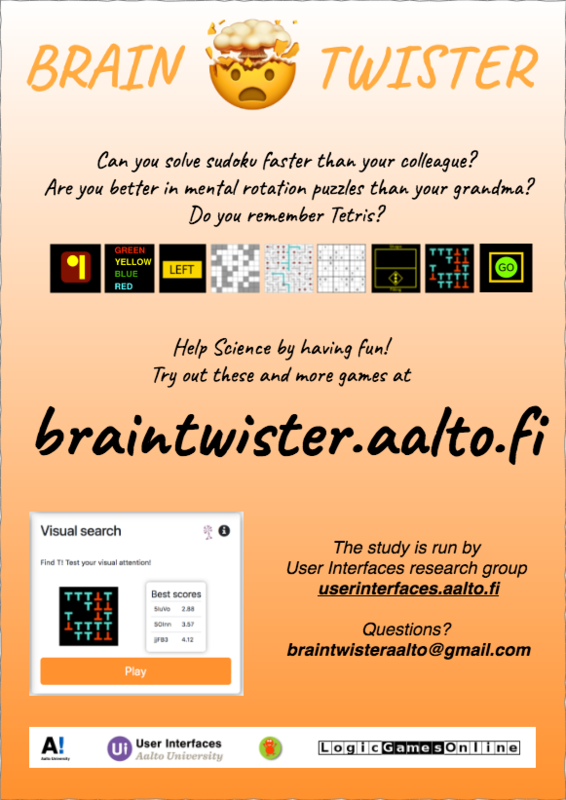 Participation is easy: just head to https://braintwister.aalto.fi/ and begin playing. Signing up is optional and allows you to see your top scores, and compare your performance with other players. As the page evolves over time, we encourage you to visit it on several different days. This would also give us richer data. We welcome your thoughts, suggestions, and questions. You can leave us feedback via the “Contact us!” form or by email to braintwisteraalto@gmail.com. This study is conducted by the User Interfaces research group at Aalto University, and funded by the European Research Council. The professor in charge is Antti Oulasvirta.